Ah, gashapon. Japan's answer to Kinder Surprise. Stick a hundred yen or two into the vending machine, twist the handle and you are rewarded with a 3" plastic pod which contains a figure or other random piece of merchandise. There are dozens of different anime figure ranges available from these machines at any one time, usually consisting of five or so different figures, the problem is that you don't know which figure in the range you will get. 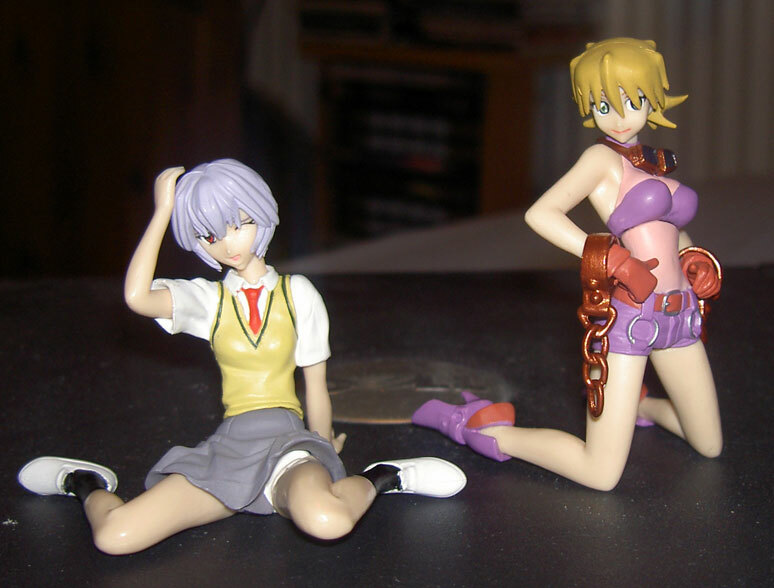 The Gainax Heroines figure range was widely available when we were in Japan and I was lucky enough to get two different figures with my small change - Rei Ayanami from Neon Genesis Evangelion and Sayoko from Melody of Oblivion. The range itself consisted of five figures, the other three were Leiqunni from Wings of Honneamise; Nadia from Nadia: Secret of Blue Water and Arumi from Magical Shopping Arcade Abenobashi. Of all the collectable figures available in Japan, gashapon are the cheapest and generally speaking the lowest in quality, particularly the ¥100 ones. The quality has improved considerably in recent years though and the figures in this range are actually pretty good for their size and cost. As is common with gashapon figures some simple assembly is required, as heads and legs are detached to allow them to fit into the pods, but the pieces slot together easily and firmly with barely visible joins. There are no instructions but the assembly is pretty common sense and no glue is required. Once assembled the figures are around 3 inches tall (6cm or so, although the standing figures, such as Nadia, would be taller) and are free standing. the only gripe I really have is the fact that Rei's legs and hand are uneven, which causes her left leg and hand to hover above the floor a bit when the figure is on a flat surface. This is a pretty minor gripe though, as other than that the sculpting is very good, and well above what you expect. 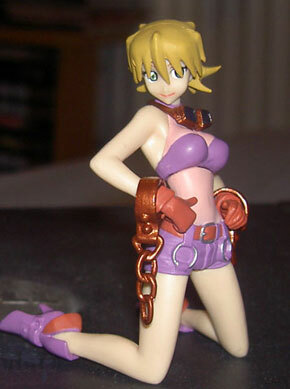 As gashapon figures go the Gainax Heroines are very, very good. The sculpting and painting is above the norm, the poses are good and the value for money is excellent. However, these things are relative and although there are few better gashapon vending machine figure ranges, there are plenty of boxed figure ranges that are bigger, better made and more impressive than these. 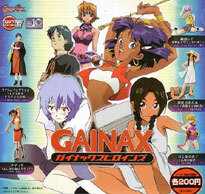 Although this is the case, it must be said that there are no alternative Gainax ranges that cover the same characters and that for value for money these are excellent, if you are a fan you should snap these up. The usual little slip of paper showing the whole range (and what the assembled figure would look like) is included in the plastic egg. The two figures I had didn't come with stands because of their pose, but presumably the standing figures like Nadia would.